The Formation of Italian, Spanish, Portuguese and French-speaking Major Superiors of the Congregation began on the evening of March 10 in Rome. While the majority of superiors in attendance come from the Conference of Latin American and the Caribbean (23), there were also superiors from the Conference of Europe (6) and the Conference of Africa and Madagascar (5). Together with the Conference Coordinators, Fr. Marcelo Araújo from the Conference of Latin American and the Caribbean, Fr. Johannes Römelt from the Conference of Europe and Fr. Zéphyrin Luyila Ndongola from the Conference of Africa and Madagascar, they gathered for a week-long program to assist in them in their role as leaders in the Congregation. Fr. Michael Brehl, the Superior General and the members of the General Council were facilitating this meeting. The event began on Sunday evening with Evening Prayer in the Chapel of Casa Sant’Alfonso followed by a Gaudeamus and dinner where Fr. Michael officially welcomed all the participants. 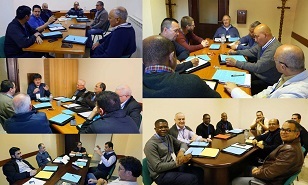 The program included a day of retreat, conferences and discussions regarding the role of the superior in this period of restructuring in the Congregation and a lot of concrete information and protocols. The new Directory of Superiors was presented and the Superiors got to know the team working in the General Curia. On Friday, 15th of March, the celebration of the Feast of St. Clemens concluded the meeting.